The fourth edition of the landmark Creativity In PR study reveals an industry that is finally starting to realise its creative ambitions. 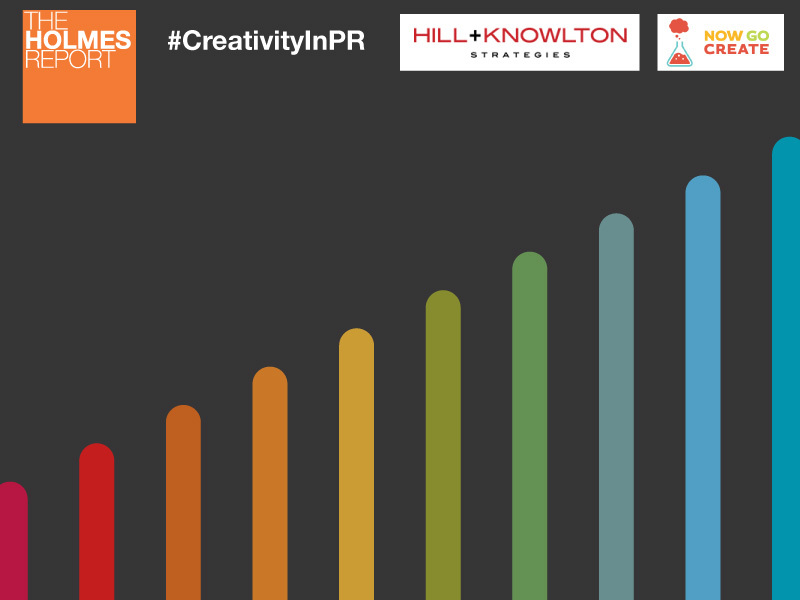 The fourth edition of the Creativity in PR study reveals that the industry is finally starting to realise its creative ambitions, becoming a critical priority amid continued concerns over talent and investment. The 2015 Report, co-authored by the Holmes Report and Now Go Create, in partnership with H+K Strategies, is based on a survey of around 500 agency and client respondents from more than 35 countries across the world. While previous findings have demonstrated a significant gap between rhetoric and reality, this year’s Report suggests that things are changing fast. In particular, the Report indicates that creativity is becoming viewed as a central element in organisational culture, rather than being seen solely in terms of output. More resources are being devoted to creativity. Creative confidence is high. And clients are more likely than ever to approach PR agencies for big brand-building ideas. Respondents answered a variety of questions, focusing on attitudes towards creativity; tools and skills; opportunities and challenges; and suggestions and advice. A PDF of the report can be viewed at the end of this story. "A lot has changed since we started the study four years ago, and a lot is still the same," says Now Go Create founder and co-author Claire Bridges. "More resources are being devoted to creativity, with plenty of businesses not just talking about it but training staff and paying attention to developing a create culture. Creative leadership is on top team agendas and creative confidence is high. But there are still key areas lacking rigour (like evaluating ideas) and HR is seemingly not really connected to driving creative practices." This year, the survey finds that 73% of in-house respondents are more likely to approach their PR agencies for big creative ideas today than they were 12 months ago, compared to 43% last year, suggesting that PR firms are starting to ‘walk the walk’ when it comes to creative delivery. In addition, almost two in five in-house respondents (39%), rate creativity as 'fundamental' to their decision to hire and retain an agency, up from 21% last year. And 70% of all respondents believe that clients are demanding greater levels of creativity from their agency. These demands are clear across the board, with many of those polled noting that consumer brands typically place the highest priority on creativity. "There are great case studies that show that more creative ideas are more effective; the Volvo Trucks ‘Epic Split’ campaign winning the Grand Prix for Effectiveness at the Cannes Lions evidences what brave creative campaigns can do even in the most unlikely categories," says Simon Shaw, chief creative officer, H+K Center of Creative Strategy. "I think clients have always demanded creativity; we have to become much better at is showing how our ideas are going to be effective and the data and insights that support to them. We will then be able to realize this demand." Despite the encouraging signs, concerns linger. Just 14% are consistently happy with PR agency creativity. Almost half (49%) are sporadically satisfied, while more than a quarter (29%, the same as last year), believe it is a constant challenge. Respondents were also asked to compare the quality of creativity in the PR industry with other disciplines. Among agency respondents, more than 60% describe it as worse than advertising agencies. Interestingly, clients appear more bullish — more than 30% think PR industry creativity is better than advertising agencies, with similarly positive results also recorded against digital, media, experiential and content agencies. fundamental, while a further 44% think it is a high client priority. Respondents were also asked how their business has changed in terms of creativity since this survey began three years. Around half (51%) noted it is more of a priority, with 47% of agencies also stating that clients expect more in terms of creativity. Meanwhile, two-thirds have no qualms about blowing their own creative trumpet at work — 14% think rate their creativity thinking/personnel as ‘inspirational’ (compared with 6.5% last year) in while 52% describe it as ‘good’. "I would argue that this not only shows how seriously people now take creativity and how they set about trying to get great results, but how much confidence is on the rise, too," says Bridges. "People who work within PR want, need and expect a daily workload that challenges them at a creative level. It's interesting that the majority of respondents this year work in corporate rather than consumer PR and the response to this question is still this high. That speaks volumes about how the industry is embracing creativity regardless of the challenge." There is clear evidence that the PR industry is moving in the right direction where creativity is concerned. Almost two-thirds of agencies (62.9%) think that the quality of creativity in PR campaigns has improved over the past year, compared to 49% last year. Encouragingly, clients also agree that creative quality is improving in PR campaigns. 56% agree with that statement, a clear increase on last year. The survey finds a modest increase in terms of the industry’s creative quality. 50% describe it as ‘good’ or ‘inspirational’, compared to 47% last year. Clients continue to rate creative quality at a lower level than their agency brethren. Just 38% describe it as inspirational or good, with more than 60% seeing it as ordinary or worse. This year's survey also explores how the PR industry is being challenged to use creativity as a driver of innovation across everything it does. This was brought home by WPP's Martin Sorrell at the Cannes Lions Festival, when he told us that he believes PR firms must embrace 'continuous reinvention'. Accordingly, 56% of our respondents think the PR industry will hire and train a more diverse creative workforce, and around the same believe it will deliver in terms of innovation. Slightly lower percentages think that the PR industry will deliver in terms of creative leadership (49%) and their agency business models (43%). Breaking down the results, it becomes apparent that clients are more bullish on certain areas. Two-thirds think that the PR industry will deliver in terms of innovation, versus 58% of agency respondents. Clients also hold a more positive view of the PR industry’s prospects regarding creative talent and leadership, but are more negative on the agency business model (34%). "We have to continually evolve," says Richard Millar, Global Chair, H+K Center of Creative Strategy. "Everything is changing in our world and our client’s world and we have to avoid the ‘being fat, lazy and happy’ trap. This trap represents safety, not only corporate safety but in some cases personal safety; a safety that paralyses our ability to change. We have to make change part of our culture. Without that, we will simply be obsolete."